In 1980, only 2 teams per region and 8 teams statewide made the playoffs per division, unlike now, when the top 8 from each region and top 32 from the entire state qualify per division. Just making the playoffs was a much greater accomplishment than it is now. The Fostoria Redmen entered the game 10-0 and ranked #1 in the UPI poll and #3 in the AP poll. Here's the article as it appeared in the Courier Crescent....WARNING, links will open a new browser window. Much easier to navigate in my opinion. The Red Rider Defense. Giving up less than 100 yds in total offense to a 10-0 team is quite a feat Two defensive touchdowns and a safety accounted for 14 of the 27 points. The Riders caused 3 fumbles, 3 INT's, a blocked punt and a safety, all in the 2nd half. 2. Fostoria played all 10 games, Orrville only played 9, having to forego the Wooster game in favor of a playoff appearance. Did Fostoria start a week earlier, thus having time to play all 10 games? I'm assuming the game was played on the night that was supposed to be the Orrville/Wooster game. In what would become a very common occurence in the 80's and beyond, a very good Red Riders team ran into a parochial powerhouse and were ousted from the playoffs. Although the score indicated a close battle, the Bengals outgained the Riders 297-106, almost a 3-to-1 advantage in total yards. Benedictine would go on to beat Hamilton Badin (another undefeated team) 9-3 the following week to capture the state title. Uni Note: Check out this picture. Notice the back of the Riders jersey? That's not a name, that's the TEAM name on the back. These jerseys were replaced shortly after the 1980 season, and with it, the name on back's disappeared as well. 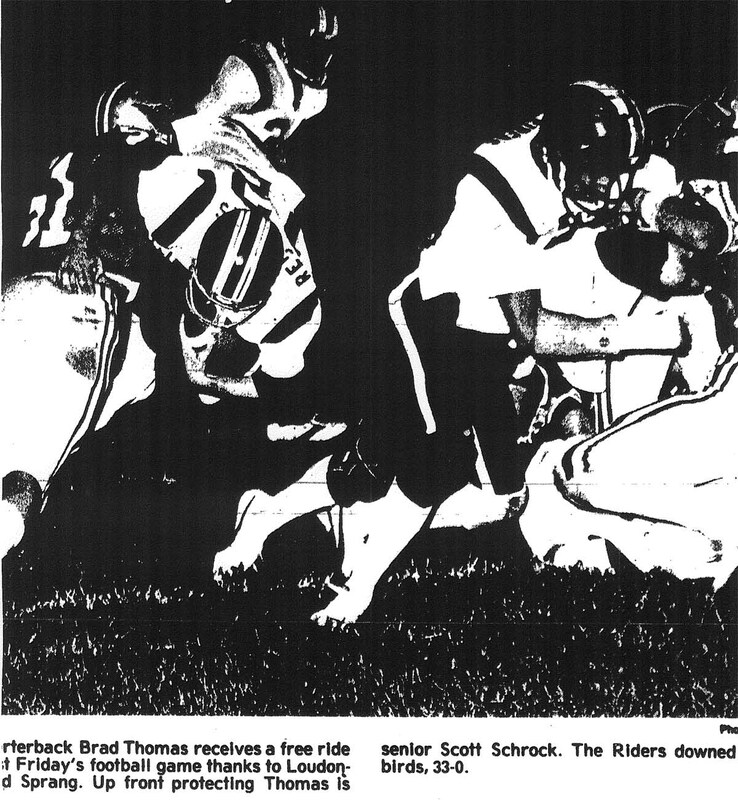 I was at that game and remember a player named Johnson who was terrific for Fostoria. Richie Johnson had a huge game, too. I know the answer to question 2, but I will post it later as I have an errand to run right now! OK, I think I have this figured out now on this posting business. All schools were told to move their schedules back one week by the OHSAA in order to accomodate the new play off deal. Nearly every school in Ohio complied with this, EXCEPT for Orrville and Wooster. Somehow, we would not be able to just move everything back and that would mean that the great Orrville/Wooster game would be played in week 1. It was decided to let the schedule stand and see how it played out. Well, low and behold, we qualified for the play-offs after week 9. My, oh my, there was a great debate about town as many of the old-timers said "the heck with the play-offs, we want to play Wooster". Most of the younger fans were gung-ho for making the play-offs, though. I just always remember how ticked some of the die-hards were about this. And that is why we didn't play Wooster that year. I would have to say that we would have added another Win to our season series if we would have played them. Well, maybe I don't have all this figured out yet, but the previous "anonymous" post was made by me, BRF. I don't like how the "anonymous" tag looks for me. Anyhow....I did some asking around and came up with this. Fostoria, being 10-0 to our 9-0, would have had more computer points and thus secured home field advantage. And, yes, the game was played on the weekend that would have been our week 10 game with Wooster. Mark Fowkes told me some things he remembers about that game. One is that he recalled that they had painted their fence around the game that very day and that people leaning against it got paint all over them. He still has the jacket he wore that night, complete with chain link embedded paint! This Johnson fellow for Fostoria had an Orrville connection, as it appears as though he attended Orrville schools at some point early in his schooling. He went on to play for Notre Dame. I enjoy the scanned articles and appreciate the effort put in to doing that.